wear a suit man, and solved problem. If the awards dinner were a daytime event, I probably would wear a suit (I have a pink Chanel skirtsuit that would be perfect). But since the dinner is in the evening, I think a dress works better. Well played Stana. You deserve a standing ovation for your exquisite answer. As a male, I believe that is a great advantage to choose only from a reduced spectrum of suits. Being a male become is a very easy thing in front of the "Why should I wear" question. But we know well that this isn´t the case, It´s more than a superficial choice of wear, the motivations to appear in public as you really are is more profound: I see all of this like a social reaffirmation of your true persona, a definitive presentation to the world. I find very interesting the fact that Stana looks more younger and happier than Mr. Horzepa.I I guess that Stan Horzepa perhaps is only a mask, a hollow body in which Stana hides inside. I´m right? Sorry If I have been so curious. I think that gender are not a rigid essence, we build our own genders along our lives, and your gender construction are very complex. An example of the wide diversity of masculinity. A male condition so close to the feminine way of life that is very difficult to determine the real boundaries and frontiers, and I find this very respectable. I´m very impressed for your choose of life, for the challenges that your family faced, your wife´s illness and your daughter´s support. I think in the many consequences of your decisions. 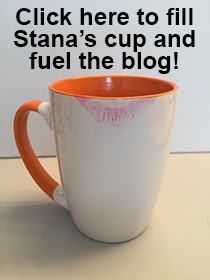 I don´t have any doubt that Stana would be very happy. But I think in her wife too. I wonder how many parts of Stana`s feminine side was constructed based on the personality of her wife? Is it perhaps possible that while Stana gains more life and youth each day, her wife sinks more in sickness and old age?After all, she married Stan, the mask, that hollow body. not the "other woman" in her equation. Perhaps Stana, as a newborn person is a little selfish. But as I said, it´s very complex. And it´s not my life, so I prefer to don´t cross that line again. Sorry for my silly questions. I´m only think off you as a peculiar protagonist of our contemporary society, with your lights and shadows. Good luck in the next days and Congratulations! Back in the day, when ladies didn't care for their staps to show, they made use of 'strap aligners' for want of a better word. These were short bits of material with press-studs sewn onto the underside of the dress' strap and once the lady was fully dressed she would thread the aligners in under other straps and clip them back on the dress strap. Where ever the dress strap went, there the other straps were forced to follow. One could of course do something similar with velcro or with clothing tape?